So I don't get the whole "he looks like a Warlord. No he looks like a Hivelord." Either case makes him a bonding hero and the Romans already have two Marro Warlord they bond with. What difference does a third make? It's not like he is the best choice for the Romans or even the third best choice. I suppose at this point it is too late to errata a "Human" onto the Roman's "Warlord Bonding". Anyway I digress, the design intrigues me enough to look beyond its attempt to "fix" the Grok Riders: to review. to review. I've thought a bit more and I still think Warlord is forcing theme a bit, but that is okay in order to get the desired gameplay sometimes. We can make up some cool backstory to justify it later. The C3V created Heroscape's first Mariedians, the people oppressed by their own creations, the Soulborg. Jarek Guy is a Mariedian warrior from an earlier time period than the M-43 Resistance and Kira Jax, using technology probably not readily accessable to the scrappy resistance. 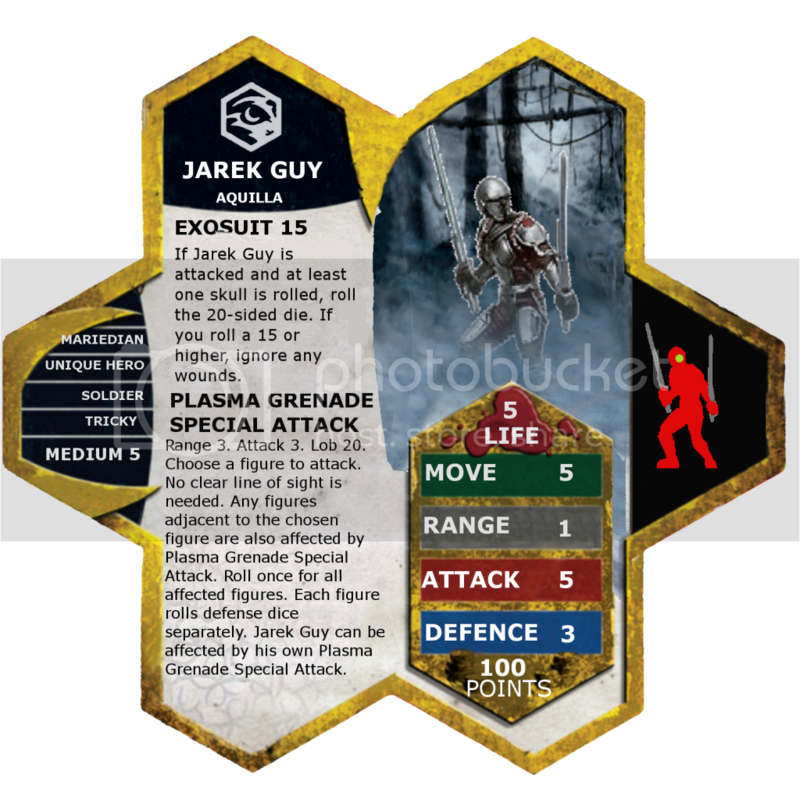 Jarek Guy is solid all-around: 5 move, a strong 5 attack, a decent 5 life/3 defense backed by a handy Exosuit, and a multi-target ranged special attack. The 100pt price tag isn't punishing either. A simple comparison is Crixus, another 5 life/3 defense hero with a defensive power, who at 10 points less lacks an explosion special attack but benefits from bonding and Spartacus. There are quite a few other comparison points as well, such as Drake (RotV), Agent Carr, Major X17, Alastair Macdirk, Heirloom, etc. Overall 100 points is in the ballpark. Jarek Guy doesn't look like the other Mariedians, other than the obvious two arms, two legs, and a head. The difference doesn't particularly bothers me, though. After all Humans in Heroscape vary quite widely, from Vikings to Samurai to Agents to whatever, so why not Mariedians? Jarek's armor has a bit of a Soulborg feel to it, in my opinion, which fits for a race that built the Soulborg. I'm not entirely thrilled with the choice of general. I'm ok with it as it matches the other Mariedians, but an armored sci-fi soldier doesn't with my vision of Aquilla. Feels more Vydar-ish to me. Not a deal-breaker for me regardless. Nothing new here, combining something similar to the Microcorp Agents' Stealth Armor and something similar to the Airborne Elite's Grenade Special Attack. I appreciate the general simplicity, though I would have slightly preferred simply reusing Stealth Armor instead of creating something slightly different. Jarek Guy is sort of a jack-of-many-trades but master of none. Or rather, not really good at any one. His potent 5 attack would suggest an assassin role like Drake or Agent Carr, but a lack of a movement power really prevents him from performing that role well. An explosion attack might suggest that he's an effective squad killer, but the painfully short range on Plasma Grenade Special Attack and the fact that Jarek can be hit by it makes it incredibly situational. The 5 life/3 defense + Exosuit combination might even lend the Mariedian hero value in the defender role, but defensively he isn't that great, and blocking with a single figure is rarely effective. But being able to do so much is useful, right? Well yes, but he's normally not all that good in any role, and most armies would rather put in a unit that does something the army needs well than a unit that does a few things sort of ok. Just ask Sharwin Wildborn how often she appears in the tournament scene. That doesn't mean Jarek is worthless though; in the right places he fits in quite well and provides quite a bit of value. One such place is alongside a team of heroes in a dungeon crawl scenario. The best dungeon crawl teams are usually composed of heroes that fill various roles, healer, heavy-hitter, defender, special attacker, etc. Losing a hero that fills a key role can be crushing for a team, so it's useful to have a hero that can step in and fill various roles adequately. Jarek is a decent heavy-hitter by himself, and can also clear out goblins with a well-timed Plasma Grenade and even hold a line for a while if need be. Another place where Jarek does well is alongside the M-43 Resistance Fighters. The M-43s don't (currently) synergize with any other defenders, heavy-hitters, assassins (well, Kira sort of is), or powerful special attacks. Jarek Guy isn't great in any of those roles, but the bonus movements the M-43s provide via Guerilla Tactics help him get into position to get the most out of his activations. As I mentioned before, getting him to effectively assassinate a key figure or blast a group of squaddies is difficult; he becomes much more valuable when he does not require order markers to get into position to take advantage of key moments. He works surprisingly well as a defender for them too, as he is often tough enough to take a few hits when out in front. And while he's there, the occasional order marker can allow him to put some hurt on high-defense figures that come his way. In essence, being a jack-of-many-trades is useful in an M-43 army because he can fill in multiple valuable roles with minimal order marker cost. Jarek Guy is a solo hero that isn't really great at any one thing, and as such will likely disappoint players more than thrill them. But in the right armies Jarek can provide a good deal of value, stepping in to fill a necessary role, whether that's a multi-hit special attacker, a heavy hitter, or just someone to take some hits. I vote to induct Jarek Guy into the SoV. Kar-Nu-Sa by Son of Arathorn has received 5 Yeas (Scytale, capsocrates, superfrog, Super Bogue, and vegietarian18 )for review and moves onto to unified fanscape evaluation. Thrangir by superfrog has passed unified fanscape evaluation and moves to the testing phase. Balance-I had a very difficult time getting Rorshack to be worth his points. When he did, it was, surprisingly, usually when common figures were his primary victims. When Rorshack Rages, he doesn't last long against any decent melee heroes. When he doesn't Rage, he has a hard time doing enough damage to them before they wear down his 5 life. In short, Rorshack does just okay in melee combat, which is the place where I would most expect him to excel. He doesn't really have the life to spare to run by screens to get at ranged heroes in the back, and doing so often requires that he Rage to get the extra move, making him more vulnerable once he gets there. I could see a Barbarian like Rorshack falling into the same power-scale as a figure like Eltahale, but this Army Card just does not make the cut strength-wise, and should be considerably lower in points at the current strength level. Powers: The powers are clear and understandable, but Roar of Triumph often felt superflous in gameplay. It was rare that Rorshack killed a Unique figure before running out of Order Markers or dying, and it was sometimes difficult to remember to factor in the defense subtraction. Altogether I found it to be a power that is not worth it's space on the card. Rage is a deceptive power. Most of the time you do not want to use it, unless you lose initiative. When you do use it, most of the time it hurts you with the defense reduction more than it helps you with the attack boost. Appropriate Stats: 4 attack is on the low end of the scale of what I would expect from a Warforged Barbarian, even before his Rage, but it is not a total fail. However, I don't understand why he has 3 Defense. If it's supposed to represent his armor, Warforged Resolve does that. Why would a Warforged Barbarian have more defense than a Warforged Soldier? 5 life definitely seems low as well. When I think of a D&D Barbarian I think of lots of life; Tandros has 7, and he's only a Fighter so I imagine a Barbarian should have at least that much. 3 Defense + Warforged Resolve is pretty tough for low-attack figures, so when Rorshack goes up against squads he usually does best when he doesn't use his Rage ability--he doesn't need it. Visual Distinctness: Since Rorshack uses one of the Warforged Soldier sculpts, he is not particularly distinct, visually speaking. However, there is precedent for repaints, and I think a non-repaint like this is fine. Altogether, I give Rorshack a FAIL in the Playability category. Creativity- Rorshack inverts the 'X' mechanic previously seen on Siege. Theme- Rorshack is similar enough to other D&D Heroscape characters to arguably fit into the canon thematically, but I have several hangups. It is odd to me that of the Warforged heroes we have so far Rorshack has 3 defense when he is, I assume, based on the D&D Barbarian, which typically has a low-defense and high-life model. Along that line of thought, I'm surprised Rorshack only has 5 life. I would have expected something more like 7 or even 8 life and 2 defense. Another big hangup for me is his name. The other Warforged all have names based around concepts related to their powers. Siege is a Juggernaught that can weather (or practice) a Siege, while Heirloom is good at picking up Treasure Glyphs (i.e. heirlooms). Rorshack's name just makes me think of a Rorshach test, which doesn't remind me of anything related to Rorshack's power set. Rage is a fitting and thematic power for a Barbarian. Roar of Triumph somewhat less so, but it is a D&D 4E Barbarian power and so not a theme fail necessarily. Altogether, I give Rorshack a FAIL in the Theme category. Accessibility- Since Rorshack uses one of the Warforged Soldier sculpts I will give him a PASS here. I vote NO to induct Rorshack into the Soldiers of Valhalla. Rorshack by William099 has received two NO votes and is removed from the process. Ah sad day. Thanks anyway guys! As to any concerns about my feelings in regards to the reviews I recieved, by no means do I feel that they were to harsh. I think they do represent accurate reflections of the unit. And I definately intend to adjust him and bring him back before you. Last edited by William099; June 24th, 2013 at 06:40 PM. 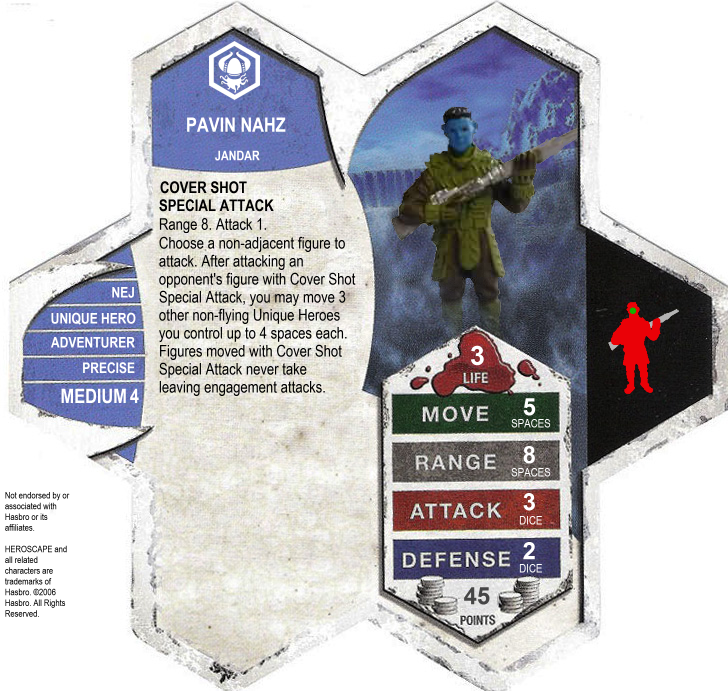 I'd like to submit my custom, Pavin Nahz, for SoV review. Balance- Pavin is generally only worth his points in multi-hero builds, and those builds by default are usually pretty weak. Pavin, however, makes those builds a little bit better by providing free movement. I liked running builds with all Unique Heroes, so Pavin could use his Cover Shot Special Attack with maximum benefit. These armies weren't usually very good, thought I had most success with Pavin + Heroes + strong Unique Squad (like the Airborne or Krav). Pavin + Syvarris + Kaemon Awa made a decent core as well. He's not a unit I'd take to a normal tournament, because you have to build an army around him to get the most benefit from Pavin, and an army with so many Unique Heroes (that aren't dragons) just can't deal with most squad-heavy builds out there. The point of this guy was to provide some movement support for heroes, not free set-up for Raelin or an easy Glyph. The non-flying clause just eliminates a lot of the support units that don't need the help. Creativity- Cover Shot Special Attack is pretty creative, in my opinion. It's based off of Agent Skahen's Cover Fire, but Pavin usually doesn't wound anything when he moves figures around. That is by design. Pavin shoots at right above the enemy's head so they duck, allowing his friends to escape. Cover Shot Special Attack also gives free disengagement when moving, which is very helpful to heroes like Arkmer, with his Engagement Strike. Theme- I picture Pavin Nahz as a Burn Notice-like figure who helps the public by doing good deeds that require some dirty work (and making some money on the side, hopefully). Of course, he always gets into trouble along with his friends but they always makes it out alive somehow. Pavin will snipe for his team, but like most good guys he isn't a killer unless he has to be. He shoots wildly at the other team, not really trying to hit them, so his friends can get to cover. Accessibility- The miniature used is the Star Wars Chiss Mercenary. abprices shows 108 in stock, with most costing only a quarter. It doesn't really get better than that. Pavin Nahz is a Medium 4 figure, about the same size as the Mariedians and D&D humanoids. Here are a couple pics. You could also thematically justify Cover Shot by saying that flying would make it easy for you to be hit by the enemies taking cover, while staying on the ground would force them to come into the line of fire to hit you. I like the simplicity of the design, and I appreciate that it's not a Raelin-boost, thematic or not.